The Philadelphia Flyers have a long and proud history, beginning with their first season in 1967-68. Flyers fans can point with pride to the team's participation in Stanley Cup Final in the 1970s (when they won two Stanley Cups), the 1980s and 1990s. And coming off their trip to the Eastern Conference Finals last year, the Flyers continue to fuel the passions of the fan base. The Flyers are returning Saturday to their old home, the Spectrum, for the final game there between two NHL teams when they host the Carolina Hurricanes at 1 p.m. ET. 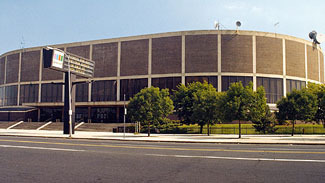 The Spectrum, the home of the AHL's Philadelphia Phantoms, will be torn down next summer to make way for a hotel, restaurants and shops. The Flyers have invited all of their former captains to join the celebration, including their first captain, Lou Angotti. Angotti looks back with fondness and pride at his only season in Philadelphia. Following the team's first-round playoff loss, Angotti was traded to Pittsburgh, through St. Louis, in a three-team deal that netted the Flyers Darryl Edestrand and Gerry Melynk. "I'm very happy and very proud to be coming back there to the Spectrum one last time as the Philadelphia Flyers' first captain," Angotti said. "The Flyers are a first-class organization and were from the get-go. I've always said that being the first captain of the Flyers is one of the things that I'm most proud of in my life. I still feel that way and my opinion has never changed. "I've been back a couple of times before and they've always made me feel like an important part of their history. They've always treated me and my family terrifically." That first season was an eventful one as owner Ed Snider struggled to find the necessary financing, right up to the season opener. Then, late in the season, the roof blew off the Spectrum, forcing the team to play important games on the road in their successful bid to win the West Division championship. "The roof fell in during an afternoon ice show," Angotti said. "We started playing a lot of our home games on the road. It was tough, but most of the players were just happy to be in the NHL." Angotti led the Flyers with 49 points (12 goals, 37 assists), while Leon Rochefort led with 21 goals. Defenseman Ed Van Impe led the Flyers with 141 penalty minutes. In the playoffs, the Flyers and Blues split the first two games, and then St. Louis won the next two. The Flyers made a series of it by winning Games 5 and 6, but lost Game 7 at home, 3-1. "Everybody goes into a season with optimism, but I can't honestly say I thought we would do as well as we did," Angotti said. "It turned out very well, but it was disappointing to lose in the first round of the playoffs to St. Louis, a team we had done pretty well against. Then again, we had a good won-loss record (7-1-2) against them but every game was close. We didn't blow them out of the rink. In the playoffs, they added Doug Harvey and Dickie Moore. Doug solidified their team. "That was so disappointing after the kind of year we had. It's like a nightmare that won't go away. There are two Stanley Cup Playoff series in my career that I never stop thinking about, the St. Louis series when I was with Philadelphia and losing the seventh game in 1971, 3-2, to Montreal after we led that game, 2-0. Bobby Hull hit a crossbar that would have made it 3-0 and then they came down the ice and scored the first goal of their comeback. "Those losses never leave you," Angotti continued. "I got to the Stanley Cup Final twice with the Blackhawks and just missed with the Flyers." General Manager Bud Poile and coach Keith Allen let the players choose their captain and they made Angotti their leader. It was a good choice. Angotti hadn't yet made his impact in the NHL, but he was a very accomplished player. He played three years with Toronto's St. Michael's Majors, under coach David Bauer, before leading Michigan Tech to the 1962 NCAA championship, under U.S. Hockey Hall of Fame coach John MacInnes. Angotti was the MVP of that Frozen Four (before it was called that) as well as MVP in 1960 when Tech lost the championship game to Denver. He played parts of two seasons with the New York Rangers, starting as a 26-year-old rookie, and parts of two seasons with the Chicago Blackhawks before being taken by Philadelphia in the expansion draft. The Blackhawks kept their eye on Angotti and claimed him in the 1969 Intra-League Draft. He played four seasons for the Blackhawks, helping them to two Stanley Cup Finals. Still, Philadelphia remains one of his fondest hockey memories, even if it was only for one season.